How to move a object along z-axes? GIMP Forums / GIMP / Beginners / How to move a object along z-axes? How do i move an object along the z-axes? Se attached file. In the tutorial it says to go to edit>distort, but the only distort i find is filters>distorts and none of them do what i want. RE: How to move a object along z-axes? 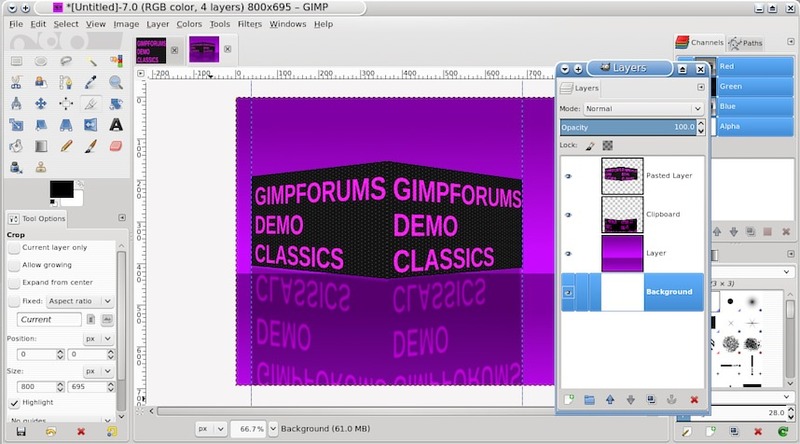 Using Gimp, do not try to slavishly follow PS tutorials, very rarely works-out, the tools are not the same. By all means use as a source of inspiration, these artists come up with some great ideas. Look at the finished work and think how you might replicate the effect, sometimes you can not, usually you can get close. An example: http://i.imgur.com/9eBIRO9.jpg detached the layers as easier to view. All based around a "cube effect" so make one side of the cube as a source image. Copy and paste as layers into a new larger image, move this around, then as fb2 said, use the perspective tool on that layer. Use guides to keep things straight the perspective tool does not do this for you. You can do that for the other side as well. If you want to you can merge these layers. The reflection is exactly the same procedure with each image 'flipped' horizontally. Then a bit of blur & a bit of reduced opacity. Add a background and anything else and might not be perfect but it will be your own work.